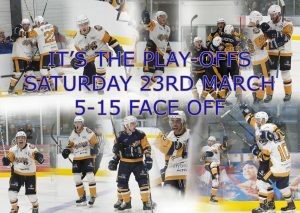 Play-off hockey is here at last as the Raiders repeat last year’s match up with a 2 game knock out weekend against the Bracknell Bees. The second leg will be played at Bracknell and you are urged to book your tickets today if you want a chance to support your team through this weekend and onto next. If you cant make todays game at the Sapphire then our live streaming service is live for this vital game and is set to be our most entertaining armchair ride of the season.